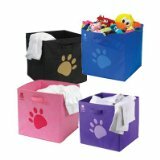 A pet toy box will help you keep all the toys of you cat (or dog) in one place. You can either make one yourself or buy one. Needless to say, pet toy boxes make practical gifts for cat lovers. A pet storage box will keep your home tidy and orderly... regardless of how many toys your cat has! Need some ideas? Check out the suggestions presented below. The easiest way to make "make" a cat toy box is to turn a cardboard box into one. It is a cheap option as well. Sturdy, office storage boxes are the best (especially those that come with a lid), but you can use whatever is at hand as long as the box is in good shape. You can also choose any size you want. A good-size wicker or metal basket. You can find inexpensive baskets at craft stores and dollar stores. Waste paper baskets. You can find really cute ones! Use a tote bag. Buy a cat-themed bag to add the feline touch. Large plastic container. If you can find one with a lid, the better. Here are a few ideas brought to you in affiliation with Catsplay.com and Amazon.com. If you are looking for a stylish, refined look, you will love this elegant pet storage box. This piece is not only attractive, but it's also functional. Indeed, you can place it in the living room and you don't have to worry about it being an eyesore. Plus, you get to hide away all of your cat's toys in one convenient place. Do you have a fun loving pet? Then you will love these whimsical cubes. They're great for both cats and dogs, and come in different colors. You will surely find the perfect piece to go with your home decor. 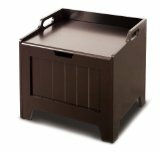 Simple yet modern and chic... this toy storage box will look good in any spot of your home. And since it's a good-size piece, all of your kitty's toys can easily fit in it. Are you also a dog lover? Does your dog have too many toys? Are you looking for a dog lover gift? Here's a cute pet box to store away all of your dog's toys. No more messes! This cube also makes a great pet lover gift. This storage box from Catsplay.com is another perfect solution for stashing away all those kitty toys. It also has a lid so you can keep your cat's toys out of sight whenever you want to tidy up your home quickly. This fun toy box has the added benefit of having a carpeted surface. So in a way, it can double as a cat scratcher. I'm sure kitty will absolutely love it! Needless to say, this cat toy box makes a practical gift for your cat loving friends.